Powers/Abilities: Matt McKinney was a normal human whose mind had been merged with an alien called Chi'arr; this increased his healing and fighting abilities although the alien was in control of Matt's body and accessed Matt's memories and abilities. Matt and Chi'arr were in constant communication within Matt's body. 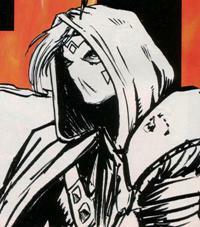 As Ripfire, he was armed with a bow that shot out energy blasts, and also carried a long-handled sacred blade. As Ripfire, he was an excellent hand-to-hand fighter and accurate archer with enhanced dexterity and mobility. He was devoted to keeping Chi'arr's people alive but could also be quick to anger. (Ultraverse Unlimited#2 (fb) - BTS/Ultraforce II#13 (fb) - BTS) - The creature called Demonseed destroyed many worlds, including that of Chi'arr. (Ultraverse Premiere#2/3 (fb) - BTS) - The survivors of Chi'arr's world transferred their conscious minds into three ships, hoping to find hosts willing to carry their minds until new ones could be cloned and with the offer of knowledge of alien technology and cures. 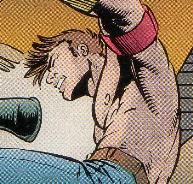 (Ultraverse Premiere#1/1 (fb)) - One moonlit Arizona night, Matt McKinney and his friends Clyde, Debbie, Jasmine, Jason, Martin, Spud, Tori and Wes (but not his girlfriend Debbie), defended themselves against a gang of rednecks. They got drunk celebrating in the desert hills when they were suddenly overshadowed by three spaceships, leaving some of the group transfixed and others panicked. 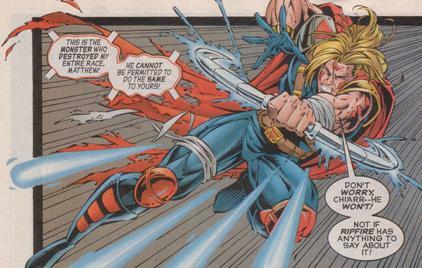 (Ultraverse Premiere#2/3 (fb)) - Unconscious, McKinney was telepathically offered the opportunity to become the host of Chi'arr and he agreed. His friends also became hosts to individual alien minds, except for Clyde who panicked and reported it to the police. The others unpacked equipment from the hovering spaceships and daubed their bodies with red markings to signify that these bodies were now inhabited. However, a policeman arrived but was killed by Martin/Ky'ron; this was seen as a leadership challenge against Chi'arr. (Ripfire#0/3 (fb)) - A bloody fight for leadership followed between McKinney/Chi'arr and Martin/Ky'ron, with Chi'arr reveling in the bloodlust he accessed in McKinney's brain. However, McKinney was able to reign in Chi'arr's fury, who then channeled his anger at McKinney, racking his body with pain. The group then saw the policeman's back-up forces arrive, and Chi'arr recognized that it had now become a matter of survival, not peace and growth. 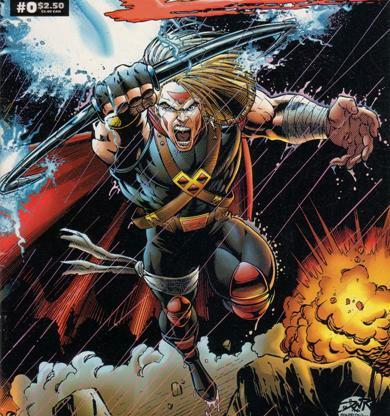 (Ultraverse Premiere#1/1) - The police and then the army attacked, with Chi'arr controlling McKinney's body, now one as Ripfire, as he dodged bullets and fired his energy bolts from his alien bow. 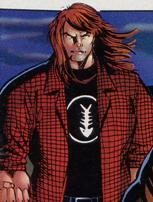 (Ultraverse Premiere#2/3) - Ripfire rested after having temporarily escaped the law, killing a rabbit and eating it raw, but armed soldiers soon approached. (Ripfire#0/3) - Two US soldiers leveled their guns at Ripfire, who instead charged and killed them. At this point, Chi'arr repressed McKinney's consciousness as much as possible. Unaware of where his friends were, Ripfire grabbed McKinney's motorbike and rode away into the night. (Ripfire#0/4) - Heading to Los Angeles, Ripfire stopped by a roadside diner at night seeking food, but was challenged by one of a group of rough bikers. A brawl quickly followed with Ripfire knocking out all opponents. (All New Exiles#11 (fb) - BTS) - The human/alien hybrids regrouped, but continued attacks against Ripfire and his people forced them underground in New York. (All New Exiles#11) - Siren and Reaper stumbled across Ripfire and his friends underneath the destruction in New York dubbed Ground Zero. The rest of the Exiles soon followed and Ripfire let loose with energy blasts, but the misunderstanding was soon cleared up. However, the powerful alien Maxis then attacked, seeking to absorb more superpowers into itself, and overwhelmed the assembled heroes just as they had managed to escape to the surface. The scene of the Exiles' defeat was watched nearby by Aladdin forces. (Ultraforce II#11) - The images taken by Aladdin of the Exiles lying defeated at the feet of Maxis was transmitted to Ultraforce's headquarters and the team left to investigate. (Ultraforce II#12) - Ultraforce came across the still bodies of the Exiles and engaged Maxis in battle. The other heroes soon revived and Ripfire joined in the effort to collapse a tall building on top of Maxis. Relieved that the alien creature had been apparently destroyed under the rubble, Ripfire and the other assembled heroes turned to face the Tulkan Fleet's alien invasion at Ground Zero. (Ultraverse Unlimited#2) - The heroes split up into three separate groups to stop the attacks led by the Tulkans' Alien Elite; Ripfire teamed with Prototype, Shuriken and Hellblade against Bemm, F'leet and Kwill. Although Ripfire managed to stop Kwill, he was slashed by F'leet's talons. However, Chi'arr quickly healed him. Soon after, once the Tulkan fleet had left, Ripfire and the others watched Reaper, Sienna Blaze and the Black Knight vanish through an interdimensional portal generated by the now benign Maxis. (Ultraforce II#13) - Aladdin forces moved in and left with the injured 'Strike. Ripfire looked at his fallen comrades, and took up Prototype's offer to join Ultraforce. The new Ultraforce headed back to their Arkansas base and discussed the threat of Demonseed, with Ripfire revealing to the group that it had been responsible for his home world perishing over 100 years before. Then the long-lost Hardcase stepped in. (Ultraforce II#14) - Hardcase told the gathered heroes of the reality-warping result of the Infinity Effect that had shunted him into limbo. 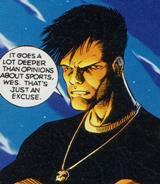 He told them that he was out to eliminate the world-destroying Demonseed, and Ultraforce agreed to back him up. They soon arrived at Ground Zero to confront the towering villain. (Ultraforce II#15) - Ultraforce attacked Demonseed, but Ripfire and several others were quickly overpowered and absorbed into its structure, although Maxis and Hardcase were able to disrupt Demonseed's energy field, thereby freeing Ripfire and the others. Ultraforce then retreated back to their base to regroup and form a strategy, with Ripfire demanding to be on the front line assault against Demonseed to avenge his fallen people. Returning once more to attack the world-killer, Ripfire led the charge but sacrificed himself to help banish Demonseed from Earth. Prime picked up Ripfire's lifeless body and took him aboard Ultraforce's dropship. Comments: Created by Darick Robertson (writer & art). 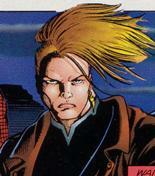 The 3-part storyline that ran in Ultraverse Premiere was collected, along with an additional story, in Ripfire#0. He was described by Robertson as a "Wasteland Warrior with strange alien technology." Clyde was a friend of McKinney. He was witness to the arrival of the aliens, but panicked and reported it to the police. Jasmine was part of McKinney's group of friends and was secretly attracted to him. She later became the host to the alien consciousness known as Cla'ire and daubed her body in red. Soon after, she witnessed the leadership challenge between Chi'arr and Ky'ron, and fought for her life when the army showed up. She later roamed with Ripfire under the streets of New York but perished in the attack led by Maxis. Jason was a good friend of McKinney's who also adopted an alien consciousness. He was caught up in the firefight with the authorities shortly after. He later roamed with Ripfire under the streets of New York but died in the attack led by Maxis. Martin had been a good friend of McKinney's for a long time. He became the host of the alien consciousness known as Ky'ron. Unfortunately, Ky'ron was aggressive and killed the policeman who arrived to investigate the alien arrival in the desert, triggering the later confrontation. He challenged Chi'arr for leadership, which led to a savage but graceful fight that the human hosts could only observe. He later roamed with Ripfire under the streets of New York but was killed in the attack led by Maxis. Spud was a one of McKinney's group of friends. She later became the host to an alien mind but was extremely afraid at first. She later roamed with Ripfire under the streets of New York but perished in the attack led by Maxis. Tori was a good friend of Jasmine. She later became the host to an alien mind but was afraid at first. She later roamed with Ripfire under the streets of New York but died in the attack led by Maxis. Wes was a solidly built man who was good friends with McKinney. He became the host to one of the alien minds and was caught up in the battle with the authorities. He later roamed with Ripfire under the streets of New York but was killed in the attack led by Maxis.